Your inquiry will process an email to us and enter your inquiry in our reservation management system (Rentalbot.com). We will respond with a price quote and information via our Website’s URL. We will also follow-up with a phone call to qualify your inquiry and answer any questions or concerns you may have; we want no surprises on arrival date!. 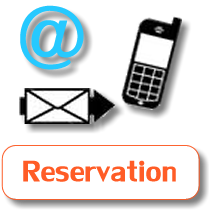 Once you have agreed to stay with us we will process a reservation with payment instructions via email. You will receive a confirmation of payment with each payment made. Once all payments are received you will get "directions to Villas de Costa Mar", "instructions for your arrival" emails, our property manager's name and phone number. We track all flights to coordinate your arrival so we ask you to supply a flight itinerary via email. Upon your arrival we ask that you call our property manager after you have secured your rental car or transportation at the airport. Property manager will meet you at the complex and provide you with access as this is a gated complex. Property manager will give you a walk through, answer any questions, explain the house rules and be your point of contact during your visit. You will receive keys to rental unit, keys to pedestrian entry gate and remote to car entry front gate. Please plan for arrivals before 5pm or inform us of late arrival times as we do not keep hotel hour. Owners will also be available to you should you need to contact them; numbers are provided in inquiry response, instructions for your arrival, confirmation of payment emails and available on our website.